What did Mr Moon say on his return? 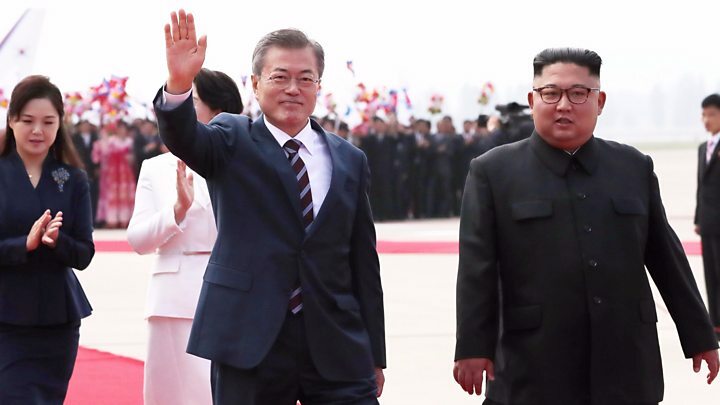 Moon Jae-in arrived back in Seoul on Thursday after a high-profile, three-day visit - the first by a Southern leader to the North's capital in a decade. Mr Moon said: "Kim Jong-un expressed his wish that he wanted to complete denuclearisation quickly and focus on economic development. 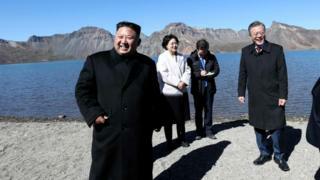 Mr Kim this week, however, agreed to shut one of the country's main missile testing and launch sites, at Tongchang-ri. This, along with what Mr Moon described as agreement "on a way to achieve denuclearisation" appears to have swayed the US. What else did Moon's visit achieve? On Wednesday evening, Mr Moon and his host attended a show of the North Korean Arirang propaganda festival. The South Korean president gave a speech to tens of thousands of North Koreans, speaking both about reunification and the aim to denuclearise the Korean peninsula. Mr Moon's trip to Mount Paektu was also highly symbolic. South Korea's national anthem opens with a reference to the volcano while for the North it is the alleged birthplace of Mr Kim's father and grandfather, and is used in propaganda to reinforce the cult of personality around the ruling family. Mr Moon has stated that visiting Mount Paektu was a "long unfulfilled dream". "Many people in the South would go to Mount Paektu from the China side, but I decided not to, pledging myself that I would go stepping on our soil," he told Mr Kim at the summit. "But time flew so fast, and I thought my wish may not come true, but it did today."